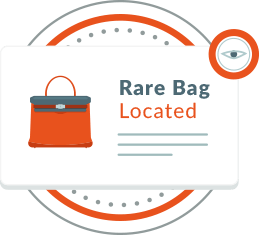 Baghunter’s Bag Concierge uses our worldwide network of trusted resellers and collectors to find any Hermès Bag within 72 hours. 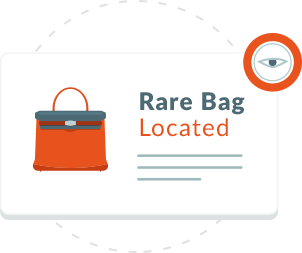 We can locate any Hermès bag regardless of color, size, style or rarity. Every bag we help a client locate using this service is first authenticated by Baghunter's experts before being shipped which guarantees that the bag is authentic. A $99 upfront fee, that’s credited towards the bag’s final price, will get our hunt for your dream bag started. Tell us some colors you’d prefer for the bag. Do you prefer a certain size of bag? What type of material would you like the bag to be? 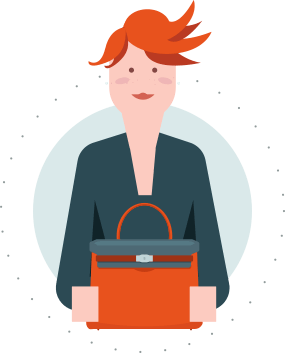 Baghunter’s Bag Concierge service is an exclusive and unique method of finding your dream Hermès handbag. As a trusted name in the ultra-luxury marketplace, we have connected with an extensive number of trusted resellers, providing our experts with the ability to locate any designer handbag in the world. 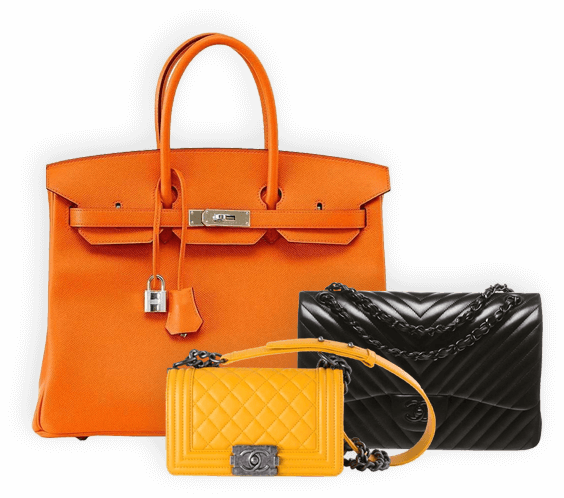 For a one-time fee of $99, you will connect with one of our experts who guarantees to locate the Hermès bag of your dreams within 72 hours, whether it is unavailable in a boutique, a limited edition bag, or an extremely rare/collectable bag. If for any reason we are unable to locate the exact bag you desire, we will refund you the $99 fee immediately! This unique service is ideal for anyone who has been hunting for a specific Hermès handbag without any luck, has a vision of their perfect handbag but can’t find a match in a boutique, auction place, or consignment listing, or any collector seeking the newest addition to their assemblage. The idea for a Bag Concierge service grew from feedback received from Baghunter clients who were frustrated in being unable to locate their perfect handbag. Initially, we tested the service with our VIP clients only. However, after a highly successful testing phase, we have now decided to open the Bag Concierge to all clients of Baghunter for a nominal fee. Our promise to all clients using our Bag Concierge service is that we will locate any designer handbag, no matter how rare or difficult to find. A simple one-time fee of $99 connects you with an expert who will personally look after your request from start to finish. Once all information about the bag desired has been acquired, we promise to find that exact handbag within 48 hours. Once we have located the bag using our network of trusted resellers, you will receive the $99 fee back in the form of Baghunter credit which can be contributed towards the purchase of the bag. On very rare occasions, our experts may be unable to find the requested designer handbag within 72 hours. In this exceptional circumstance, we are more than happy to fully refund the $99 fee immediately. We fully believe that we are able to locate any designer handbag worldwide and have implemented our no risk guarantee as a statement of our confidence. Baghunter is one of the most trusted luxury marketplaces online. We have been covered by numerous prestigious media outlets thanks to our research and knowledge of ultra-luxury handbags and the industry in general. Our ground-breaking studies into Hermès and Chanel handbag values have gained worldwide media attention and recognition. 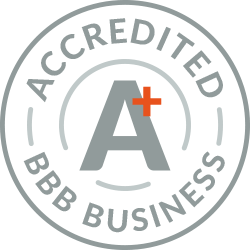 Baghunter is also accredited by the BBB (Better Business Bureau) with an “A+” rating for maintaining continuous positive customer ratings and a high level of trust as an online marketplace. We are extremely proud to offer this unique Bag Concierge service to our clients and strongly encourage everyone who uses it to leave us a review. All reviews published are unbiased and genuine reviews from clients of Baghunter’s Bag Concierge service. I have always been obsessed with light green, but have never been able to find a handbag that was the perfect shade. I discovered that Hermès had a limited edition color called Kiwi and Lichen which was the exact color I was looking for, but trying to find a bag in that shade was impossible. So, I decided to try out the Bag Concierge on Baghunter to see if they could find this illusive shade on a Hermès bag and within 72 hours an expert had contacted me to tell me they had found one!! I was overjoyed and now never leave the house without it!" As an artist, I love my handbags and accessories to be a little different and to stand out from the crowd. I had saw a picture of a Hermès Constance on a forum with beautiful artwork and just had to have it. Using the Bag Concierge service I was connected with an expert and sent a picture of the bag for them to find. Just 72 hours later I was told that the bag had been located and was mine! Fantastic service that I would highly recommend! My wife adores exotic skin Hermès bags and has a huge collection with every skin you can imagine. This made finding a bag for our anniversary difficult as I wanted to get her something very special. I talked to an expert at Baghunter and explained my wife’s love of exotic skins and how it would be perfect if I could find a bag that featured her three favorite skins, crocodile ostrich, and lizard. I held little hope that such a bag even existed, but a couple of days later received a call to say they had located one. I even received it in time for our anniversary. I am extremely impressed with the service I received and will certainly use it again in the future. I had tried for months to find this Chanel Plexiglas bag. I had visited dozens of Chanel boutiques, searched everywhere online, and even researched auctions around the world, but with no luck. I then heard about the Bag Bespoke service and thought I would give it a try as a last ditch effort to get my dream bag. Just two days later I was contacted and told the bag had been located. I can’t praise this service enough from the fantastic customer service to the speed at which the bag was found. Thank you Baghunter! I have known the exact Chanel bag I craved for years, but had never been able to find one I could buy. I needed help and the Bag Concierge service offered by Baghunter provided it and more. It took only a couple of days for them to find a bag I had been trying to find for years. The expert I was connect with was very friendly and helpful and the service was amazing! I would highly recommend using Baghunter to find any rare handbag and save yourself the hassle! There is a $99 concierge fee to cover the costs of finding a bag. VIP Club members receive this service for free. *If our bag concierge is not able to locate the bag you are looking for the $99 concierge fee will be immediately refunded to you. If our bag concierge does locate the exact bag you have requested the concierge fee then becomes non-refundable and will be applied towards your purchase. Please click the "Pay Now" button below to complete your Bag Concierge request and our Bag Concierge will get to work right away to locate your dream bag within 72 hours. *Once we find the bag you are looking for we will credit the $99 concierge fee towards your purchase. In the rare case we are not able to find the specific bag you are looking for within 72 hours, the concierge fee will be immediately refunded. Sorry, we only provide this service for Hermes and Chanel bags at this time.